- We are really worried about a potential decline in berry abundance, because there is no other food in the fall that the bears can forage on efficiently to get fat, Professor Jon Swenson says. Swenson and Professor Atle Mysterud lead the 2015/2016 CAS project on indirect effects of climate change on harvested large Mammals. – Bears are really nice species to work with because they are asleep half of the year. – The first day here at CAS I thought this year would be the best of my academic life. Normally, we are rarely physically based in the same place as those we collaborate with; we usually work separately and have little time left for discussions. To have one year to actually be seated together, to think and work on the same project, and discuss it in depth, is a luxury and a fantastic inspiration. – Our hobbies are our lives, in a way. This is what we live for, and what we want to do, and all of a sudden somebody says: do it! This CAS project is analytical: the researchers, who normally work at different universities, run their data from the field into statistical models. They want to understand better indirect climate effects on harvested large mammal populations, coming to the problem by comparing different species. They look at how climate affects food distribution and the harvesting process in particular. – Climate effects have often been studied as direct effects on temperature, rainfall, and snow, and so on. You assume a direct link, but if climate affects trophic interaction, it can cascade to affect the plants, the predators, and, in this case, to human harvesting. – It’s how humans respond to the climate: how they change management systems, for instance. Say that they imagine it is going to be a bad year for bears; hence, there will be a lower quota for licensed hunting. Sometimes managers lower the quota more than expected, so that the bear population can increase. These indirect effects have not been well studied, and that is the scientific background of the project. – We are becoming more aware of the indirect effects through trophic cascades. What happens when one species affects another, and then a third? 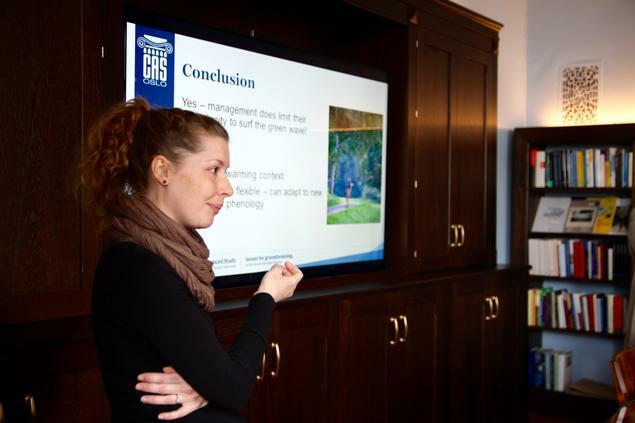 – We showed that snow melting can delay forage availability. Knowing that fresh foraging is good for the deer in terms of forage quality, we demonstrated the importance of snow on summer forging conditions by tracking plant phenology. – That bears think about the risk of being shot by a hunter actually makes them less efficient foragers. 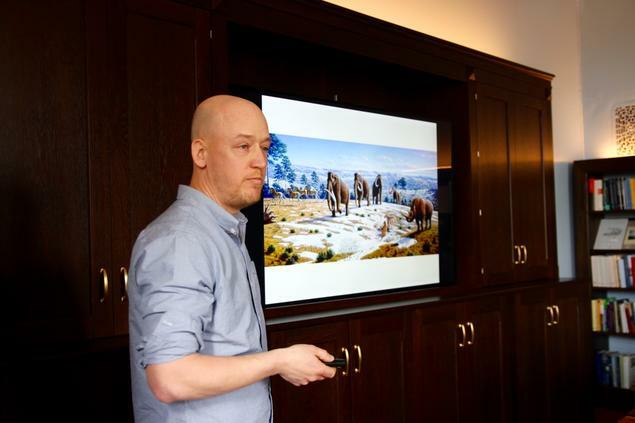 – The demographers Christophe Bonenfant and Richard Bischof in our research project are building a platform to establish a link between individual traits, such as body size and survival, and how this links to recruitment. You also have to understand how these factors are inherited from mother to offspring, and how that evolves, as the individual grows, through ontogeny. That the issue is linked to the indirect effects of climate change is known because the researchers know the pedigrees of these animals. With the pedigrees, they can separate what is heritable and what is environmental change, according to Mysterud. – Using this model, one can predict a hundred years ahead, if you link this to how climate develops, for instance. – If distribution evolves over time, why? Is it due to fewer berries and that they adapt to this new situation, which is termed phenotypic plasticity, or is it a combination of smaller individuals doing better in such a situation and that some of it is heritable? If the individuals decline in size over time, there is certainly a climate component, but may there also be some heritability involved? To understand this—selection is the only way to understand where we will be in a hundred or two hundred years. – It could be that the climate is affecting berry production, so that there are fewer berries and less food for the bears. It could be that selection has led to smaller bears, with those with smaller parents surviving because of the reduced amount of food. We see evidence that the hunting regime differentially saves the mothers that keep their young for two and a half years, compared to those that keep their young for one and a half years, because all family groups are protected. That lowers the mortality rate for the females that keep their young longer, but they are usually the smaller mothers. This scale of this model enables the researchers to understand more of the effects that they observe. – We can look at activity, heart rate, body temperatures, and variations in those, which allow us to monitor hibernation and what drives it. Is climate change affecting when bears go into the den and when they leave it? Of course, the body temperature gives an idea of how much energy they are using. – Bears are especially practical to work with because they sleep half of the year, Swenson says, smiling. This means that the researchers do not have to monitor them in the winter. – We have to change the collar every third year. When females have yearlings, we catch them all. We put the implant in the yearling females. With this implant we don’t have to catch them again during the first few years of life, when they are growing rapidly. It sounds a little dramatic to implant a transmitter, Swenson admits, but argues that this is ethically better than capturing the bears by helicopter every year to change the radio collar, which would otherwise be necessary when the bear is growing rapidly. Thus, the researchers can sit in their CAS offices in Oslo and receive data on how the bears are doing from one minute to the next. – The bear is an interesting model for a modern human disease syndrome: we get fat and we are not very active. The bears also get obese and they have a lot of cholesterol in their blood. The bear gains fifty per cent of its weight during the autumn, and then they lie down for six months. A human would never get up again. Read more about why CNES, the French Space Agency, is interested in research into bears. All of the carnivore populations in Norway are on the country’s red list of threatened and endangered species. That there are so few of them is a direct result of legislation that allows large numbers to be killed each year; in other words, argue Mysterud and Swenson, the low numbers of carnivores remaining is a result of specific political decisions. – Large mammals in Norway are doing fine at this stage. Partly because snow still falls at high elevations. So far, the effect of climate change on red deer has been positive, both in terms of less snow in the winter, and because there is a bit more snow in the mountains. – In Norway moose are everywhere, except a few areas on the west coast. But this is a recent phenomenon, as for all deer species. There were no roe deer in Norway in 1850. I don’t know the detailed history of moose in Europe, but there have been moose further south, and it is quite clear that they were eradicated by humans. – It is not so much so that moose are in danger of being eradicated, but climate change is affecting the productivity of the moose population. At this point, the positive effects of management due to changing human attitudes are so positive that if there were a negative effect of climate we would be able to buffer this by lowering our harvesting quotas. Swenson says that bears mate in May and June, but the zygotes are not implanted until hibernation. Indeed, the researchers can read from the logging devices when the zygotes are implanted and when the young are born—both of which occur during hibernation. – This is quite interesting. Spring in many areas in Norway comes three weeks earlier now than twenty to thirty years ago. Of course, the optimal time of birth has changed. For our study species, we ask if they are rutting earlier, as gestation length is quite fixed and the timing of rutting should be directly linked to timing of birth in spring. But for Swenson’s study, we ask when implantation occurs. Then again, how much is due to phenotypic plasticity? How much can these animals change, and how much is inherited? – Those that choose to mate a bit earlier do better. That has a direct link to selection, but we expect significant phenotypic plastic responses to climate change. In bears, this has a lot to do with the availability of berries. In any case, it will certainly have an effect on population performance. – It looks as if snow and temperatures are driving when bears are going into the dens. That is an important time, because just before and right after they have gone into the den is also the period when most people are injured by bears. It is important for us to understand what is going on at this time and to try to inform people about how to avoid bears during this sensitive time. – Is that because they are grumpy when they are about to go into hibernation? – That’s a really interesting question. During one recent summer, on more than 300 occasions, members of a bear group walked fifty meters from bears lying in a day bed. 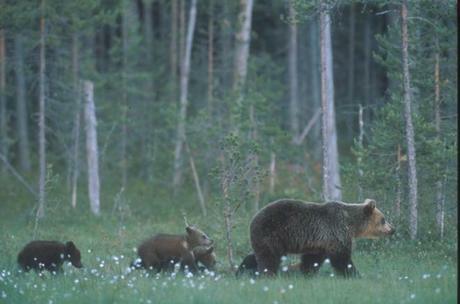 Researchers found that [in this situation] the bears always hid and then most of them fled. The bears changed their behaviour for the next two or three days, becoming more nocturnal. – People, even researchers who know where they are and can follow them using radio equipment, did not hear or see bears [they were near] for 85 per cent of the time. That means that a meeting between a person and a bear is one that a bear experiences as much more dramatic than the person, because the person doesn’t even know that he/she was near a bear. The bear really reacts, however. – It seems reasonable to think that when bears are on a lower physiological plane, they have less physical ability to run away and react to danger, such as a meeting with people. Instead of running away, they may sometimes attack, because they feel threatened or cornered. We are able to answer such questions through these data loggers. – These are very low productive populations, but still, imagine this one species living in three totally different environments. – In Asia, it is mainly humans, not climate, that cause extinction. In western countries, large mammal numbers are generally increasing. – Large mammals can deal with this; we don’t expect these species to go extinct on a global scale. On local and regional scales, they can and have gone extinct. 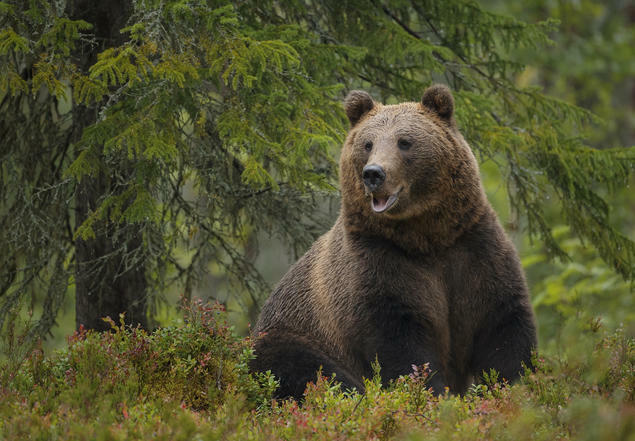 In Europe there were brown bears everywhere, and also in northern Africa, Egypt, Libya, Morocco. Mostly, people are responsible for carnivore extinction. What has changed over the thirty years that the bear project has been running? – About 1,000 bears existed in Sweden when we started. Now there are 3,000. The hunting rate was very low and now it is so high that the population is going down. We have seen that several reproductive variables have changed: the age of first reproduction, and the time the mother keeps the youngFrom the climate model Richard Bischof has completed for the study period, we see the changes in climate. We have looked at the food habits fifteen to twenty years ago, and we can see from at least last year that the species of berries they are using has changed. We are following that to track the availability of berries. Swenson goes on to ask whether the changes are due to climate change, or population density, or is it hunting regimes? – Of course, that is why we need this big model that looks at everything at the same time. 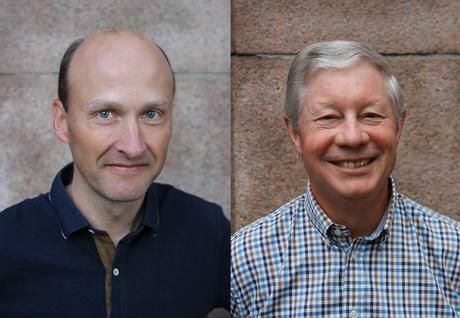 Due to differing national management goals, there are many more bears in Sweden than in Norway, Mysterud and Swenson agree. The major reason concerns methods of sheep husbandry, but there is also a different attitude towards bears in Sweden, they argue. – Even in the late 1800s, when Sweden and Norway were in a political union, Sweden decided to protect the bear so it would not go extinct. But a hundred years later, in Vassfaret in southern Norway, one could buy a car for the bounty money for shooting a bear. That is a pretty dramatic difference. – The bear project has been going on for thirty-two years, which is still below the maximum lifespan of a brown bear under natural conditions. Early in the project we had several bears up to thirty years old. We had a thirty-year-old male who we hoped would die a natural death, until he was poached. Now the oldest we have is twenty-four. – That is one of the reasons why we study the harvested population. 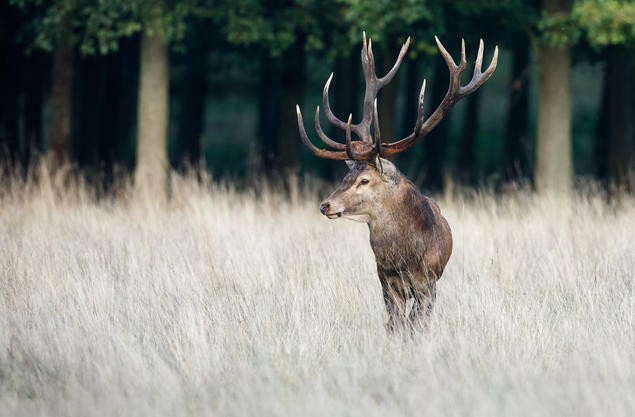 Male red deer are less than ten per cent likely to reach four years of age; ninety per cent of them are shot before this. We expect that to have had a major effect on life history evolution, but there is little data available to document it. – Richard Bischof’s PhD intended to contrast the difference between natural mortality and hunting mortality, but we ended up contrasting hunting mortality and other human mortality. – Bears live until they are killed by a human, pretty much. What consequences do you expect from climate change? – Over time we have built up a hypothesis. The most obvious point is that roe deer and red deer will increase in numbers, because they are at their northern distribution range. We are a bit more concerned about moose, because the productivity of moose populations decreases at higher temperatures Mysterud answers. 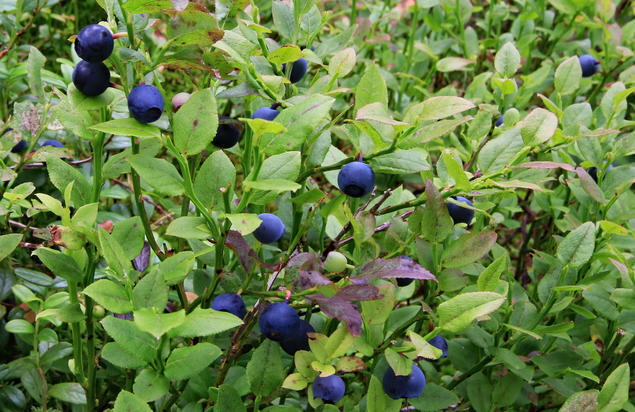 – Based on experimental studies on the effect of late winter thaws on the mortality and production of berry-producing species, we expect that climate change will cause a significant negative effect on the main foods that Scandinavian bears use to obtain fat for their winter hibernation—blueberries, crowberries, and lingonberries, Swenson says. The bears eat about a third of their weight in berries per day to increase their body weight by fifty per cent. – We are really worried about a potential decline in berry abundance, because there is no other food in the autumn that the bears can forage on efficiently to get fat, Swenson continues. – For example, the population density of bears has increased a lot, which we know is important, but climate change and changes in management come on top of this. – This can also inform national management. 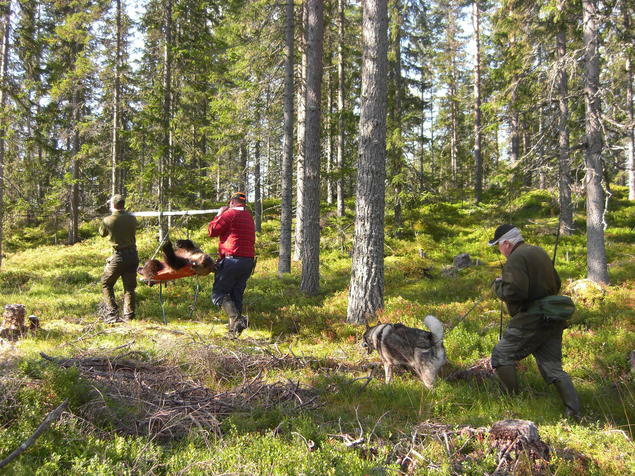 In Sweden they shoot 300 bears a year. Of course, the advice from Swenson’s project is that it is really important—the way it is managed. That is also a reason for studying the effects of harvesting. This is curiosity-driven research, but it is certainly useful for management. What do fewer bears in Norway mean for the ecological environment? – Actually, they are starting to get some interesting answers to that question … the e. One is that the bears are formidable spreaders of seeds. They eat a lot of berries and plant seeds. They travel so much that they probably are very important seed dispersers, as are birds too. – That affects the plant quality and the reproduction. They could actually document the effects on plants of bears eating ants. – Even if you don’t remove the sheep and have a herding system, like we did for thousands of years, it changes the effect on the landscape, because the sheep will graze differently. Everything has an effect.